The Celtics have trailed by at least 20 points in each of the last three games, including two losses, and overall they have lost 4-of-5 on a road trip that began 10 days ago in Indiana. At the moment, we find certain truths to be self-evident. “We’re not as good as we think we are,” Kyrie Irving told reporters after Sunday night’s defeat at Portland. An overreliance on the 3-pointer. Do the Celtics want to shoot 3s? Of course. Just about every NBA team does now. But watch this sequence late in the game against Portland. After Kyrie Irving misses, Al Horford collects an offensive rebound right near the basket. Horford could have easily spun and dunked, laid the ball or drawn a foul, but he immediately kicked it back out for – you guessed it – a 3-pointer. In fact, the Celtics end up missing two 3-pointers after Irving’s initial miss. Is this a horrible play by Horford? No. But it speaks to the nature of the current NBA. Last year, the Celtics ranked 10th in 3-pointers attempted per game (30.4). This year, they currently rank third (37.6), behind only the chuck-and-duck Houston Rockets and the new Milwaukee Bucks. And then there’s this: Hero ball. So fine. That’s one bad shot. But then Irving ran a pick-and-roll with Horford that resulted in what felt like a forced jumper over Jusuf Nurkic, though the Celtics ended up with the rebound. Pay attention to what happens after that. Irving and Tatum don’t seem to be on the same page, and now it’s Tatum who defaults to ill-conceived hero ball. Out of sync on defense. As for the Celtics’ work on the other end of the floor, that hasn’t been perfect, either. 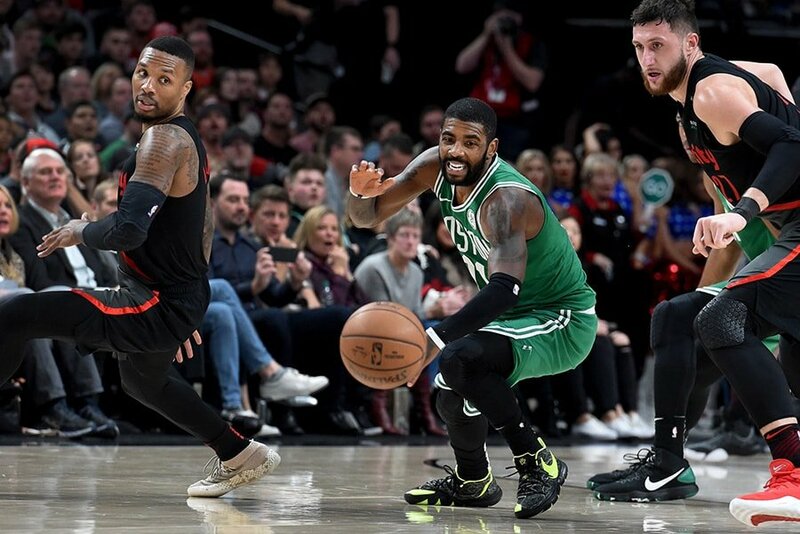 Late in the game against the Blazers – twice – the Celtics dropped off Al-Farouq Aminu, who promptly buried a pair of 3-pointers. For a team that prides itself on defending the 3 – the Celtics ranked first in that department a year ago and are first again so far this year – their play of late feels lazy and undisciplined. And then, on this play, Hayward again collapses on Lillard, leaving Aminu open – albeit several feet behind the 3-point line. Before anyone suggests that we’re blaming Hayward here, we’re not – at least not necessarily. But what we’re seeing from the Celtics on both ends of the floor is a team that looks out of sync. The Celtics are back home starting tomorrow.